Iraq - A Province of Iran? After American forces leave Iraq at the end of 2011, Tehran will try to turn its neighbor into a satrapy, i.e., a satellite state, to the great detriment of Western, moderate Arab, and Israeli interests. On April 7, the MeK released intelligence exposing Iran's growing capacity to enrich uranium, a revelation the Iranian foreign minister quickly confirmed. Still from a Fox News video of Iraqi military forces assaulting Camp Ashraf. On April 8, even as U.S. Defense Secretary Robert Gates visited Iraq, the country's armed forces attacked Ashraf. Fox News and CNN footage shows Iraqis in U.S.-supplied armored personnel carriers, Humvees, and bulldozers running down unarmed residents as sharpshooters shot at them, killing 34 people and injuring 325. The top secret plan-to-attack order of the Iraqi military, "Iraqi Security Forces Operation Order No. 21, Year 2011," reveals how Baghdad sees the Ashraf residents as "the enemy," suggesting collusion between Baghdad and Tehran. This incident took place despite fresh pledges by Baghdad to treat the Iranian dissidents humanely and to protect them. U.S. Senate Foreign Relations Committee Chairman John Kerry rightly described the attack as a "massacre" while former governor Howard Dean called the Iraqi prime minister a "mass murderer." The U.N. High Commissioner for Human Rights "condemned" the attack and the U.N. Assistance Mission for Iraq (UNAMI) expressed "deep concern." 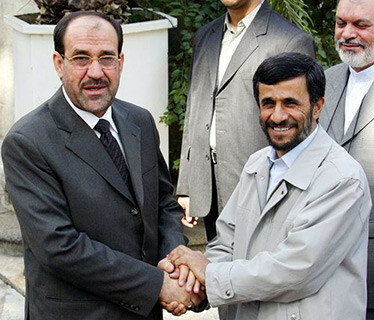 Iraqi prime minister Nouri al-Maliki and Iranian president Mahmoud Ahmadinejad. On April 11, the advisor for military affairs to Iranian Supreme Leader Ali Khamene'i (according to a news report) "praised the Iraqi Army for its recent attack on the strongholds of [the MeK] and asked Baghdad to continue attacking the terrorist base until its destruction." On April 24, despite United Nations insistence that "Camp Ashraf residents be protected from forcible deportation, expulsion or repatriation," Baghdad and Tehran signed an extradition agreement which state-controlled Iranian media interprets as a mechanism forcibly to transfer MeK members to Iran, where they anticipate a horrific fate. Iraqi maltreatment of Iranian dissidents both raises humanitarian concerns and points to the MeK's larger importance as a mechanism to thwart the U.S. goal of minimizing Tehran's influence in Iraq. That said, Washington – which granted "protected persons" status to the Ashraf residents in 2004 in exchange for their surrendering arms – bears partial responsibility for the attacks on Ashraf; in 1997, it threw a sop to Tehran and, contrary to both fact and law, wrongly listed (and continues to list) the MeK as a "Foreign Terrorist Organization." Baghdad exploits this terrorist tag. For example, Congressman Brad Sherman (Democrat of California) reports that "in private discussions the Iraqi ambassador's office has said the blood is not on the hands of the Iraqi government but is at least partially on the hands of the State Department because the MeK is listed as a terrorist group and accordingly, Iraq doesn't feel that it has to respect the human rights of those in the camp." The terrorist designation also offers Baghdad a pretext to expel Ashraf's residents and possibly extradite them to Iran. UNAMI was founded in 2003 and is headed by Dutch politician Ad Melkert. The U.S. Government should delist the MeK as a terrorist organization, following the wishes of a large bipartisan majority in Congress, of Barack Obama's former national security adviser, and of prominent Republicans. The European Union should impose economic sanctions on Iraq if Baghdad continues to block an EU parliamentary delegation from visiting Ashraf. (The EU is Iraq's second largest trading partner). The United Nations should station a UNAMI delegation in Ashraf, guarded by a small U.S. force, to deter future Iraqi attacks and to fulfill the U.N. High Commissioner for Human Rights' demand for "a full, independent and transparent inquiry" into the Ashraf assault so that "any person found responsible for use of excessive force" be prosecuted. Now is the time urgently to act on Camp Ashraf - a bellwether of growing Iranian influence over Iraq - before Tehran turns Iraq into a satrapy. May 12, 2011 bis update: I lacked space above to include a quote from former U.S. attorney general Michael Mukasey: "What has enabled this [attack on Ashraf] ... is the continued listing of the MeK as a terrorist organization." Related Topics: Iran, Iraq | Daniel Pipes receive the latest by email: subscribe to the free mef mailing list This text may be reposted or forwarded so long as it is presented as an integral whole with complete and accurate information provided about its author, date, place of publication, and original URL.